Since the 2011 Dodge Challenger SRT8 392 first hit the news, people have been speculating just how much power the new 392 cubic inch Hemi makes and for the second time in less than a month, Dodge is offering up more positive results of a new dyno test. During one of my trips to the 2011 Detroit Auto Show, I had a chance to speak with Scott Vandekerckhove, the man behind the wheel of the 2011 Challenger SRT8 392 that toured the country on Dodge’s Hemi Highway Tour. Scott was excited to tell me that they had gotten both cars (the 2011 Charger and 2011 Challenger R/T) on the dyno once again and this time, the cars made more even power after a few thousand miles went onto the motors. Click here to read the results of the original dyno run early this month. 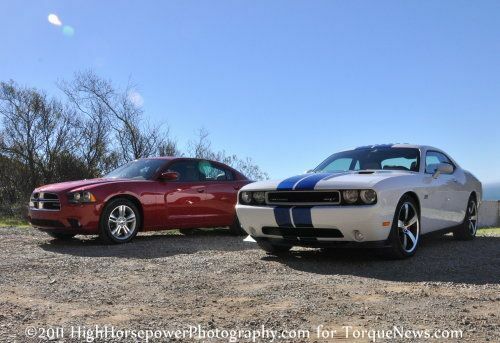 Earlier this month, Dodge announced that they had gotten the 2011 Challenger SRT8 392 and Charger R/T on a dyno and the cars both made impressive amounts of power. The Challenger made 420 rear wheel horsepower (RWHP) and 419lb-ft of torque; with the Charger powered by the 5.7L Hemi making 327 RWHP and 349lb-ft of torque. These numbers would suggest that both vehicles are underrated based on their factory ratings of 470hp for the Challenger and 368hp for the Charger but during a recent trip to Hennessey Performance, Scott and co-pilot Heather Heughens (driver of the Charger) got even bigger numbers on the dyno. There were no modifications made to the vehicles other than the driving miles from the Hemi Highway Tour and after making 420 RWHP/419TQ on the dyno previously, the 2011 Challenger SRT8 392 put down 432 horsepower and 424lb-ft of torque – an improvement of 12 wheel horsepower and 5lb-ft of torque. Click here to see the Challenger on the dyno – this video is incredible and the car sounds great…make sure to have your sound turned up! The 2011 Charger saw even bigger improvements as the motor had more time to break in, going from 327 to 340 horsepower and 350lb-ft of torque to 365. Click here to see the Charger on the dyno; it also sounds great but if it were up to me, I’d go with a little healthier sounding exhaust – nothing that can’t be fixed via the aftermarket or the Mopar Performance catalog! Dodge made this information official today at their official blog, RedLetterDodge.com. You can read more about the Hemi Highway Tour, the trip to Hennessey Performance and their dyno runs by clicking here!